"We stood in the doorway for a moment, transfixed by the column of fire towering in the black sky. It was a prairie fire--still far away but being blown toward our place by high winds, and coming closer all the time." These fires slow down the invasion of trees from the edges of the prairie and from wind-blown seeds. Prairie plants, unlike trees and other non-prairie plants, are highly adapted to drought and fire. If trees were also adapted to grow on prairies, prairie plants would not survive. The trees would throw shade on the smaller plants and deprive them of the full sun they need to grow. 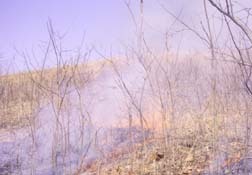 Fires help to speed up decomposition to return nutrients to the soil. Nitrogen-fixing legumes have increased growth after fires, which helps restore nitrogen back into the soil. A fall burn adds vital nutrients to the soil, creating a dark exposed surface. This surface warms more quickly in the spring to help speed germination.